Graston Technique is an advanced form of myofascial release. The procedure is instrument assisted and is used to detect and release fibrous restrictions or adhesions that produce pain, weakness and functional limitation for the patient. The Graston Technique uses patented stainless steel instruments that are designed to be applied to varying anatomical parts of the body to precisely examine and treat a variety of neuromusculoskeletal conditions. The stainless steel instruments allow us to better detect and treat these areas because it glides along a patient’s muscle, tendons or ligaments and acts like a scar tissue stethoscope. When knots or bands of scar tissue are encountered, both the doctor and the patient experience a vibration sensations or a granular feeling which a restriction. The instruments magnify what the hands feel. They can detect thickening, ridges, adhesions, fibrotic nodules, crystalline deposits and scar tissue. The instrument can then be used to “break up” this restriction or adhesion. Stretching exercises are then used to promote re-alignment of the fibers so that they behave more like normal, healthy tissue. The benefit of the Graston Technique is not only in detection of restrictions or adhesions, but also in the amount of improvement that takes place in a short amount of time. It speeds rehabilitation and recovery and even can help resolve chronic conditions that have been though to be permanent. Unfortunately, the unaided hand is hard pressed to detect and break up as much scar tissue as the stainless steel instruments can. It is because of these reasons that Graston Technique is used to treat elite athletes by over 431 professional and collegiate organizations, including the US Olympic Team, Ohio State University, PGA Tour, Cleveland Indians, Cleveland Browns and Cleveland Cavaliers. Please click here for a complete listing of all of the organizations currently utilizing the Graston Technique. GT is utilized on-site by 86 major corporations and is included in the curriculum at more than 43 respected universities and colleges. Clinicians at these organizations and institutions are treating elite athletes, patients, and employees every day and counting on GT to get them to function injury free at the highest level. Graston Technique® is used by more than 24,500 clinicians worldwide in some 3,042 outpatient facilities and by more than 431 professional and amateur sports organizations. While Graston Technique is often used for athletic injuries, Dr. Bryan D. Royer utilizes it to treat all types of patients. Dr Royer was the first clinician in the Toledo, OH area who is certified to use the Graston Technique and he is a Graston Technique Specialist (GTS). The combination of Graston Technique and Kinesio Taping can help make the difference in athletes or spectators alike. Dr. Royer is also certified in sports medicine as a Certified Chiropractic Sports Physician. He was trained in Sports Medicine by the Medical Director for the US Olympic Team. Fascia is a very strong type of tissue that provides structure and support in the body. It connects or binds many types of tissues while providing structure and protection for the tissues. Individual muscle cells group into bundles of muscles and these bundles of muscles join to form the larger muscles that we give names, like biceps, hamstrings or quadriceps. 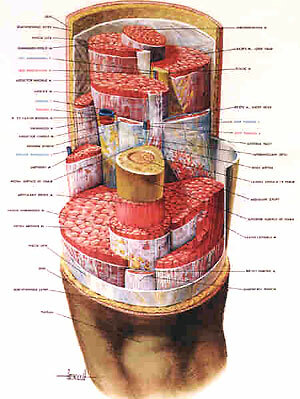 Fascia envelopes each muscle cell, muscle bundle and individual muscle and it is also found just underneath the skin. The fascia not only provides support and protection for the muscles and skin, but it also allows for proper gliding of distinct muscle bundles and separate muscles over each other and in relation to the skin. To get an idea of what fascia looks like, I often tell people to picture the nylon spider webs that can be bought around Halloween. Most people have had encounters with fascia when preparing meat products as fascia is the whitish colored thin sheets of tissue between muscles or muscle and skin. 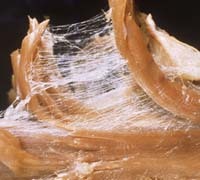 The white areas in the picture to the right represent fascia and the white strands in the picture on the left is fascia that has been separated when muscle tissue was dissected and teased apart. You can get a sense of fascia and how it connects with the skin. Notice how much movement your skin has by wriggling the skin over your forearms or scalp versus on the palms of your hands. There is much less movement on the palms of your hands as that makes it easier to grasp objects. If the skin over your forearm or hamstring had decreased movement, this could reduce the movement of the associated joints. Injuries to the soft tissue can occur due to sprains & strains, repetitive movement disorders and blunt force trauma. Sprains and strains occur when the ligaments of a joint or the muscles associated with the joint are torn or stretched beyond their normal mechanical limits. Repetitive movement disorders or cumulative trauma disorders develops when a minute injury occurs repeatedly from overuse or misappropriate use of a body part during the repetitive performance of a limited number of physical movements. This can occur with incorrect computer ergonomics on a keyboard or with the repetitive stress of playing an instrument among other things. Blunt force trauma refers to a type of physical trauma caused to a body part by impact, such as being hit by a pitch, and often results in bruising. This joint and muscular dysfunction can lead to more adhesions, which can cause a cycle of pain that must be broken. Imagine two pieces of paper laying on each other sliding back and forth with very little resistance. Now imagine that these two pieces of paper are crumpled up and when the paper tries to slide back and forth, the creases and folds catch on each other and restrict the amount of movement. 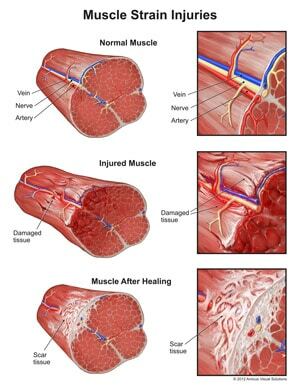 This is comparable to what happens to muscle, fascia and skin in the presence of an adhesion or restriction. There are many techniques that address the removal of myofascial restrictions, including deep tissue massage, rolfing and myofascial release, but they are limited by the practitioner or the technique itself. Only Graston Technique can be easily used to both detect and release scar tissue, adhesions and fascial restrictions. Proper management of the adhesion also requires that the patient be taught appropriate stretches and rehabilitative exercises after a comprehensive evaluation of their condition. Graston Technique allows the patient to achieve quicker, improved outcomes compared to these other techniques and does so with less treatment time as well. Graston Technique allows Dr. Royer to provide his patients enhanced care by an improved ability to locate soft tissue adhesions with more precision, especially around bony prominences, and at greater depth. Dr. Bryan D. Royer is the only clinician in the Toledo, OH area to incorporate Graston Technique and the Kinesio Taping Method in his practice. Graston Technique along with a proper stretching and strengthening program causes a reorganization of the fibers in the haphazard scar tissue into ordered fibers that are parallel with the intended movement. This restores normal function of the muscles and joint and allows for faster improvement. The combination of these two techniques can be instrumental in returning an athlete to play or allowing one to wash their hair in the morning.